PracticeLink.com S P ring 2018 51 the JOB SEARCH issue loan forgiveness. The major downside to signing a contract so early in the job-search process is that you're committed to work somewhere long before you're finished with residency. During that time, you may make all sorts of decisions that could interfere with that employment arrangement. For example, you might decide you want to live elsewhere in the country, you might get married to someone who wants to live somewhere else, or you might decide you want to work for a specific practice or even switch specialties. A lot can happen over the course of several years of training. Zero in on desirable locations By early fall, most physicians usually know where they want to be geographically, says Shipton. She finds that they often they want to move to be closer to family. Or they're clear about whether they want a big city or small, urban or rural setting, mountain or beach, or a specific region of the country. Many have also started to research which hospital systems or practices have openings in their specialty — or are likely to soon. Liner's medical specialty of neurointerventional radiology is what he calls a "super subspecialty." "There aren't a lot of people who do what I do," he explains, which means that there aren't as many programs or spots available, and "once spots are filled, they're filled," he says. "I had to start early to have a chance of getting one of those openings." Making his job search even more challenging was that not only was Liner looking for a position in a field with very few openings each year, but he also had a very small geographic target area. 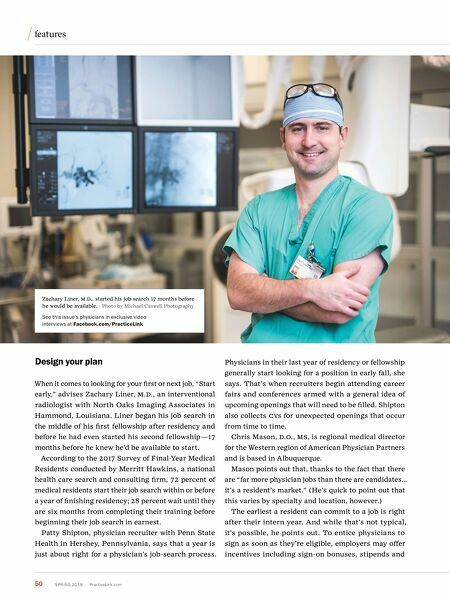 Most interventional radiology jobs exist in major cities, he explains, but he and his wife had decided that after living in New Orleans, Texas, San Francisco, and Rochester, New York, they wanted to make southern Louisiana home —where he and his wife had grown up. He knew that his odds of finding an interventional radiology opening in southern Louisiana were slim, so he wanted to start introducing himself to anyone in Louisiana who might have a need for a physician with his skillset. "It was constantly on my mind that the job I wanted wasn't open — that I had to create it," he says. Few programs were looking for a doctor with training in both body and neurointerventional radiology. "It's a unique skillset that sets me apart," says Liner, but with so few hospitals and practices actively looking for someone with such unique training, he was aware that his job search could be difficult. It was likely he would need to convince a practice that he would be a valuable addition, and work with them to create a new role rather than take over an existing position. 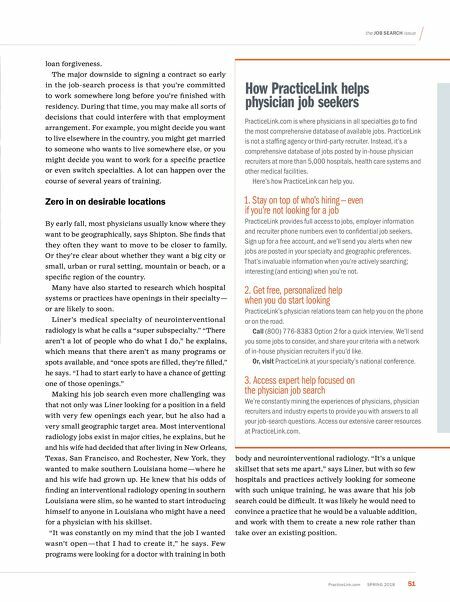 How PracticeLink helps physician job seekers PracticeLink.com is where physicians in all specialties go to find the most comprehensive database of available jobs. PracticeLink is not a staffing agency or third-party recruiter. Instead, it's a comprehensive database of jobs posted by in-house physician recruiters at more than 5,000 hospitals, health care systems and other medical facilities. Here's how PracticeLink can help you. 1. Stay on top of who's hiring — even if you're not looking for a job PracticeLink provides full access to jobs, employer information and recruiter phone numbers even to confidential job seekers. Sign up for a free account, and we'll send you alerts when new jobs are posted in your specialty and geographic preferences. That's invaluable information when you're actively searching; interesting (and enticing) when you're not. 2. Get free, personalized help when you do start looking PracticeLink's physician relations team can help you on the phone or on the road. Call (800) 776-8383 Option 2 for a quick interview. We'll send you some jobs to consider, and share your criteria with a network of in-house physician recruiters if you'd like. Or, visit PracticeLink at your specialty's national conference. 3. Access expert help focused on the physician job search We're constantly mining the experiences of physicians, physician recruiters and industry experts to provide you with answers to all your job-search questions. Access our extensive career resources at PracticeLink.com.